Living in San Antonio is fantastic and comes with no shortage of reasons to be here. A beautiful river that rolls through the city, lots of jobs and a relaxed lifestyle on top of it all. Another great part of living here is the temperate weather. And while the winters don’t get too cold–the summer is fiery and hot–but great for doing all the outdoor activities we Texans love to do! However, both the slight chill of the winters and the hot heat of the summer mean– those who live here really need to take a look at the energy efficiency of our homes. Not doing so, in fact, could cost you hundreds or even thousands of dollars in energy loss. And, 3M Window film is the perfect solution to conserve energy all year round keep your San Antonio home running efficiently, thereby saving you money. 3M window film is great at keeping the temperatures in your San Antonio home even. The results of applying this film are–a reduction in hot and cold spots and indoor temperatures that are neither too hot or too cold. Replacing drafty windows is an option that does about the same thing but is incredibly expensive to have done. Window film is more cost-effective and comes with a host of other benefits like glare control, UV protection and added security. When your windows are insulated at the level that 3M window film technology takes them to, the air you pay to heat is soundly trapped inside and the result is your home stays toasty and warm. This also means your heater runs less frequently which lowers your bills in the winter and reduces HVAC repair. Just like 3M window film traps in heated air–it traps cooled air inside too. 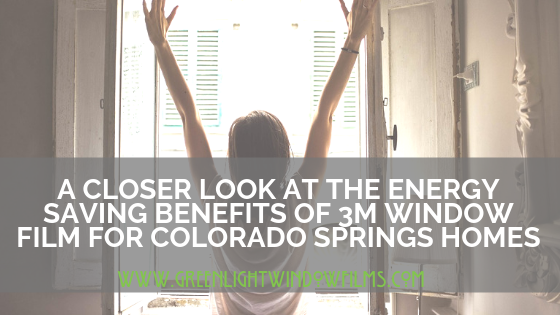 At the same time, it reduces hot and cold spots in your home by blocking out San Antonio’s intense sun rays and reducing the solar heat gain on your windows. Another great benefit of 3M window film? You can keep the curtains or blinds open, even in the heat of the summer, and enjoy the lovely San Antonio views! For more information on 3M window film for your San Antonio home, contact us at Greenlight Window Films in San Antonio today!